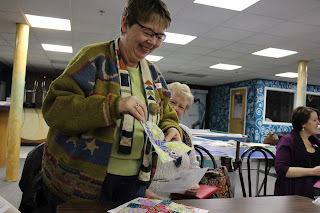 What a fun meeting we had this month, yet again! 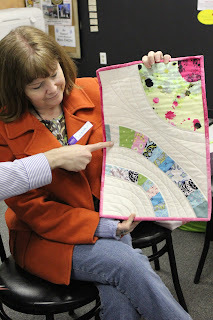 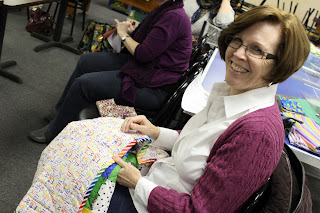 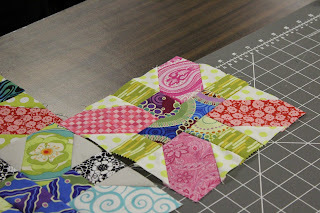 We shared our challenge projects made using scraps from last meeting's swap! 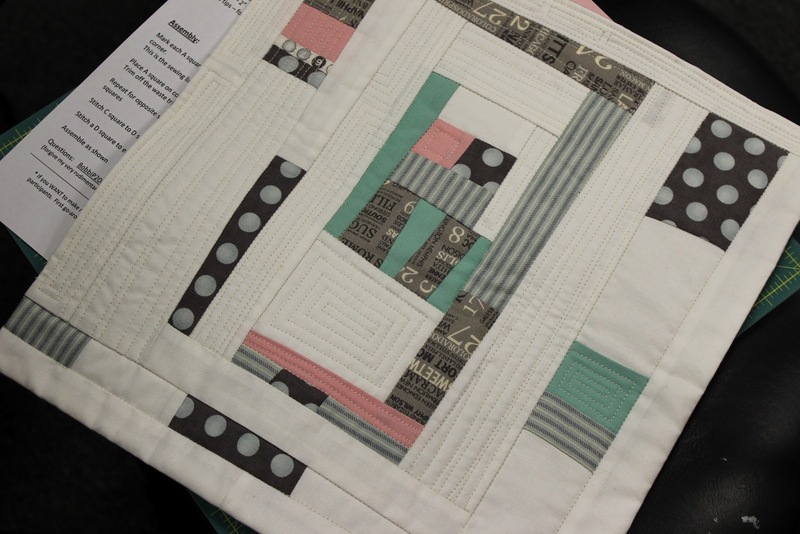 The idea was to create a "Scrappy Modern" project incorporating either improvisation or asymmetry (or both!). 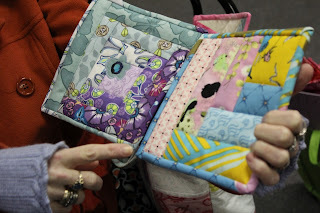 ...and two pot holders! 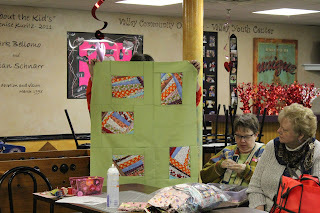 Can you guess who's scraps she got? 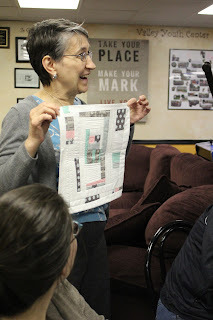 Yes, all the large areas of white are all small squares! 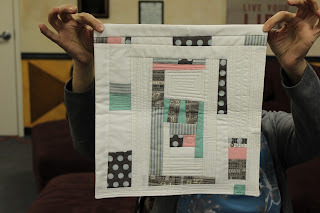 she really used negative space well too! 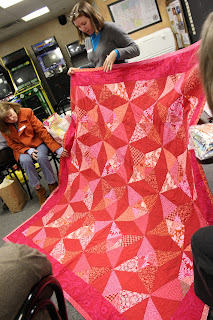 Lancaster showed us this beauty! 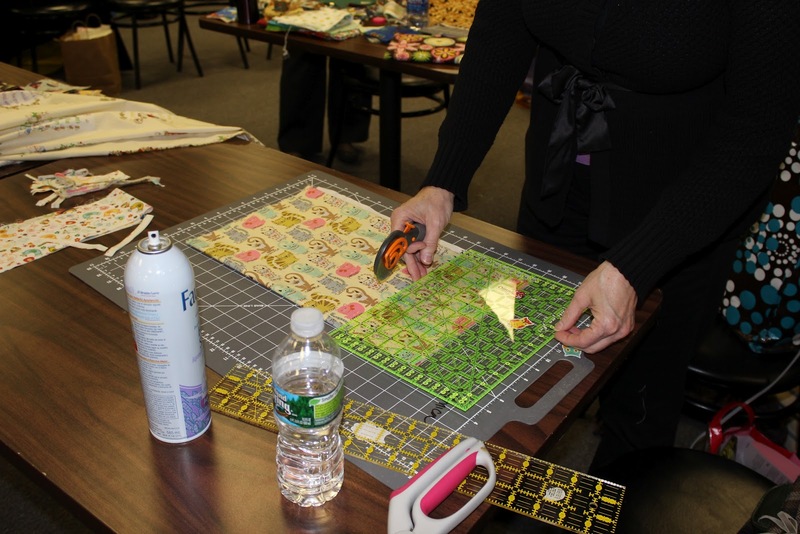 Cathy working on the binding for a charity quilt. 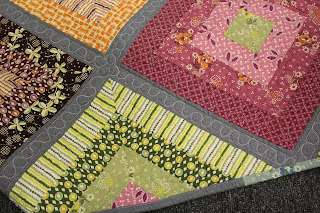 selected by Julie Herman of Jaybird Quilts. 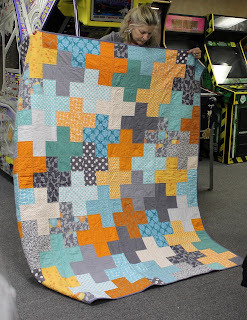 (there was a step missing), but in the end it turned out great! 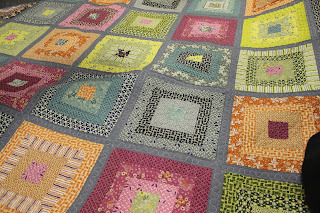 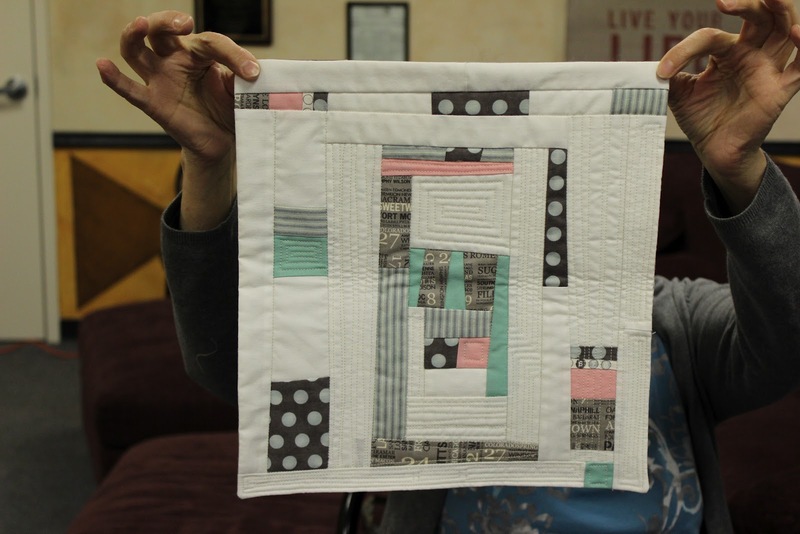 Anna's amazing string-pieced Hope Valley quilt. 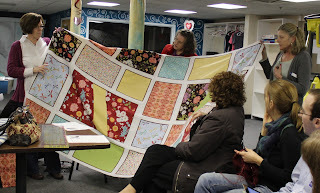 Everyone "ooh-ed" and "ahh-ed" over the fabric selection! 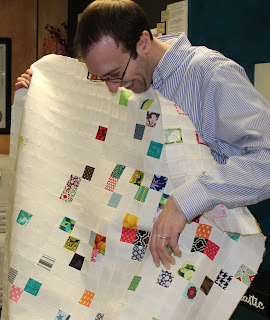 IKEA duvet cover for the backing! Genius! 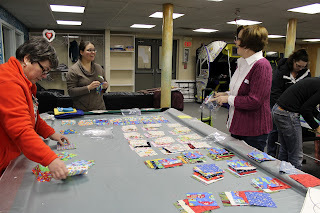 Angie shared a charity project that we will be working on. We’re making "I Spy" quilts for children. 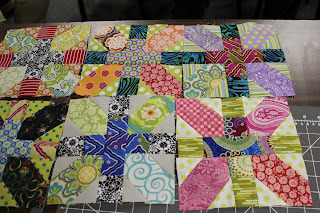 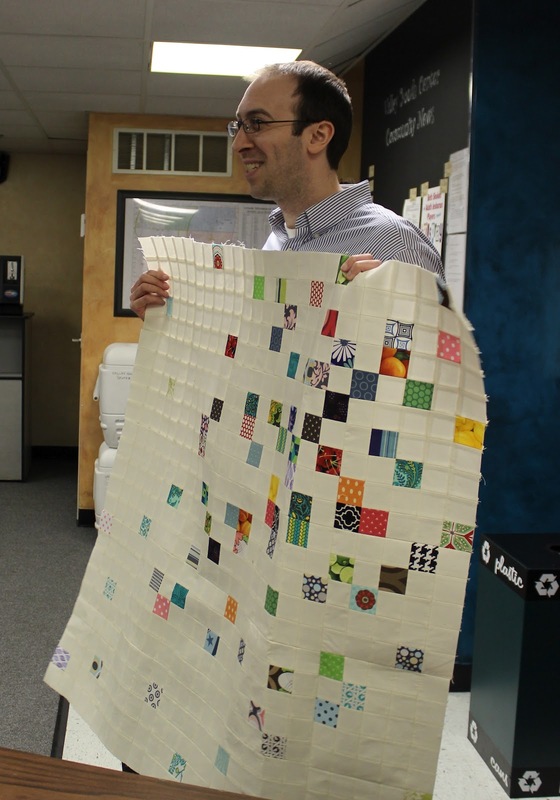 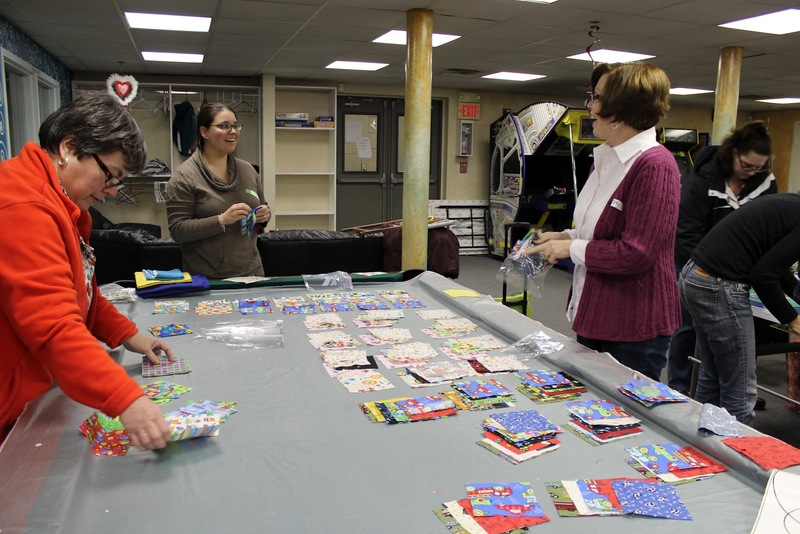 We worked together to iron, cut and pre-assemble 5 inch squares of novelty prints to be used to make 9-patch blocks. 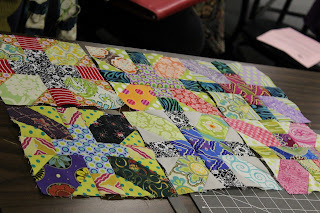 We all took some home to work on for the next meeting. 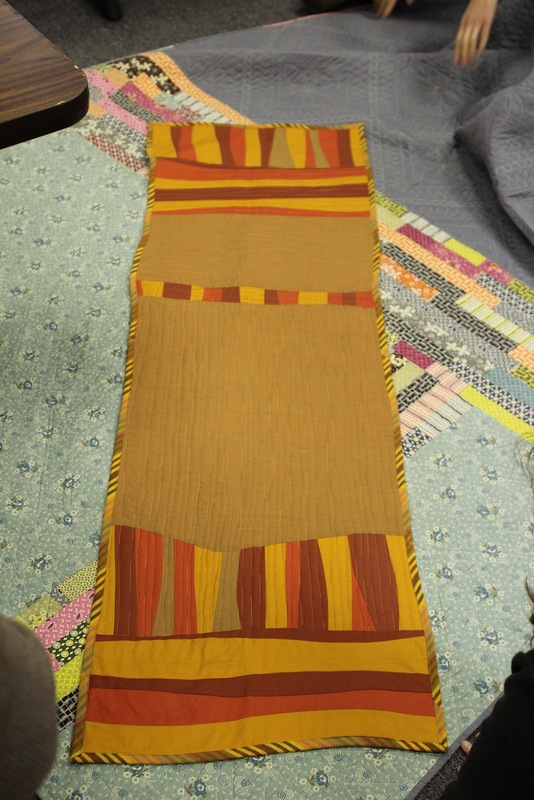 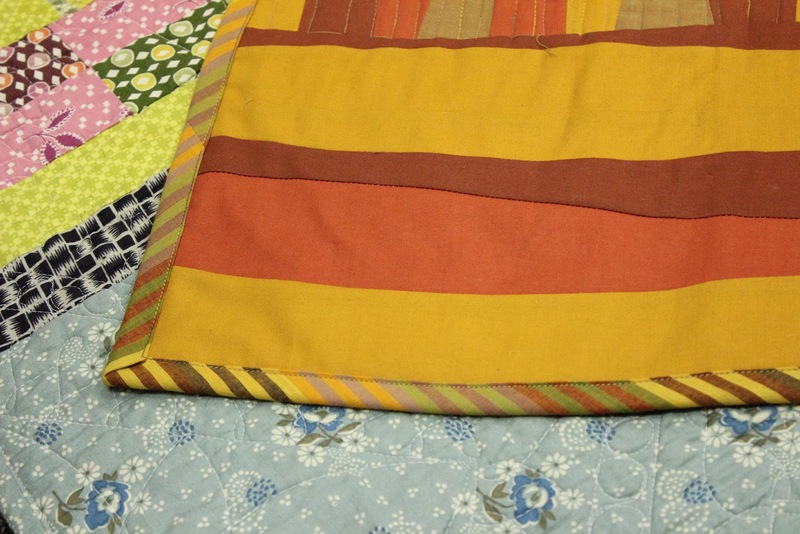 We plan to put a modern spin on these quilts, which we will unveil when they are further along. 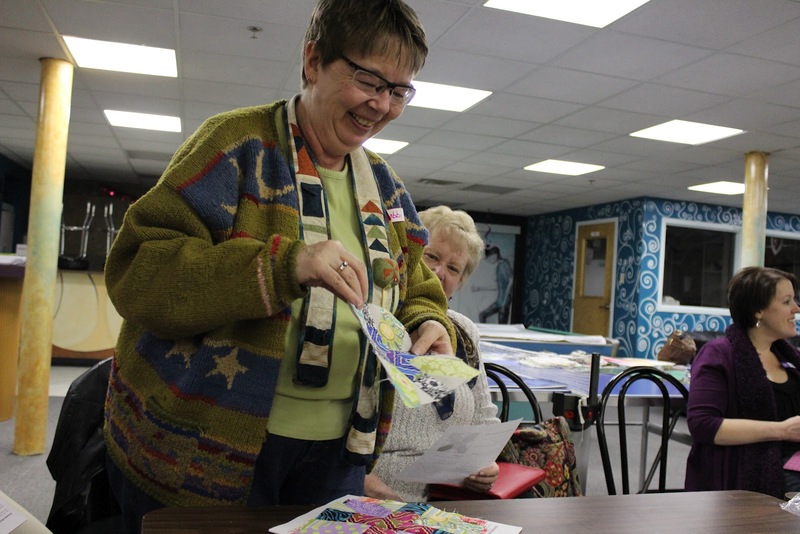 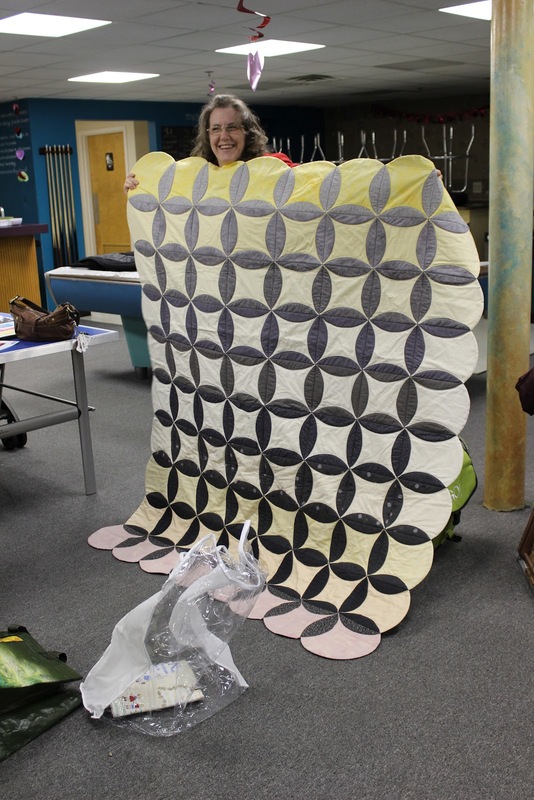 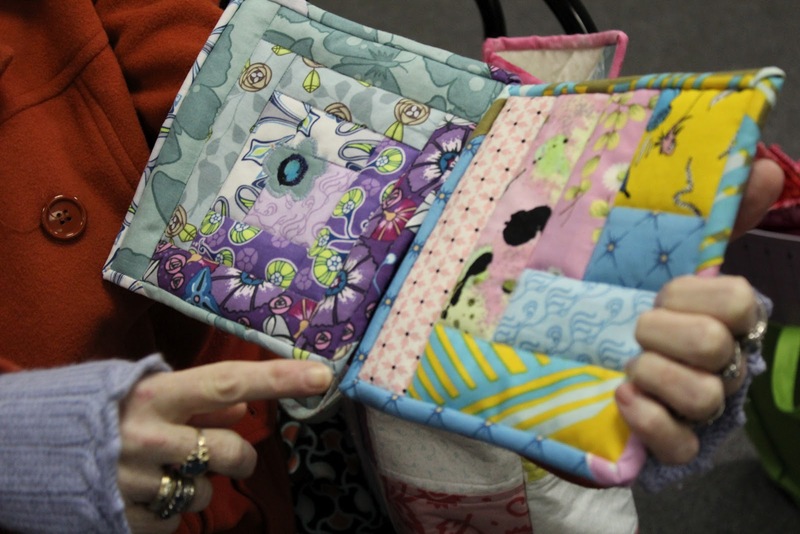 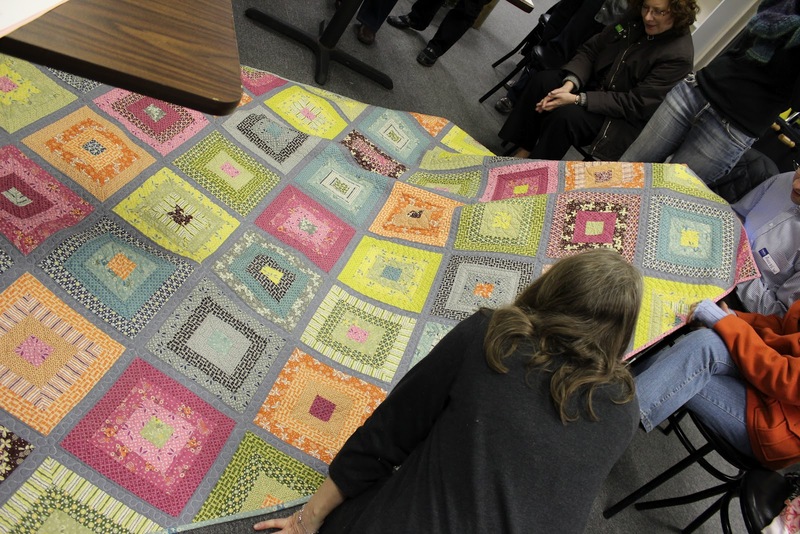 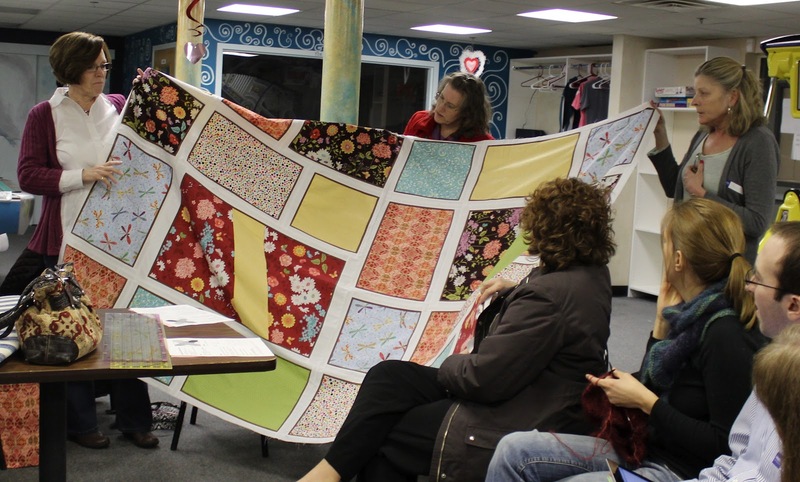 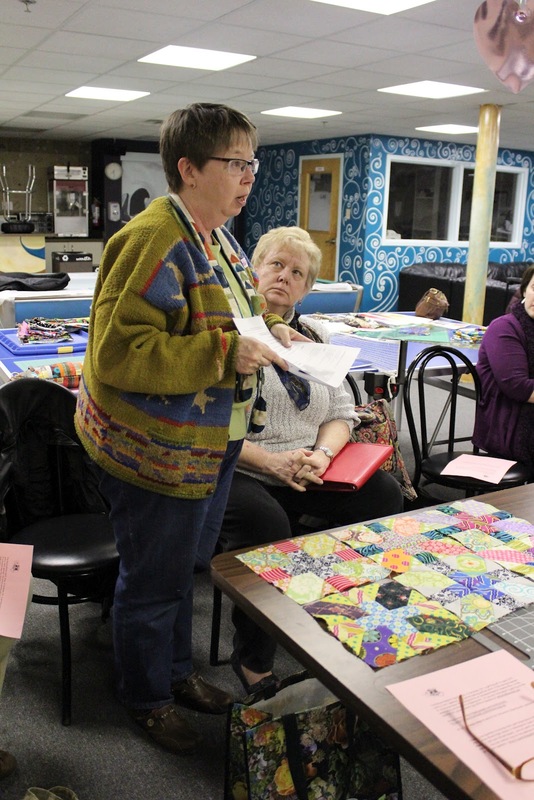 The Lancaster Quilt Show will be held at the same time as the AQS show. County Line Quilters is having their quilt show 3/24 and 3/25. There’s a new shop opening soon! It’s called the Round Bobbin Quilt Shop in Horsham, PA. Soft opening: 3/17. 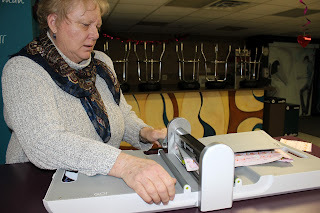 Grand opening: later in the spring/summer. 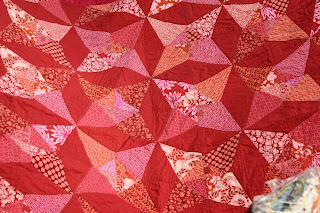 Email Sue Wilkin Edelman at wilkin01@hotmail.com to get on the mailing list. 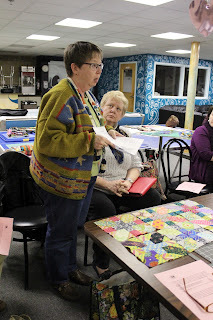 The Modern Quilt Guild will be having its first ever conference next February. Member Spotlight on... Susan DiBartolo!